No need to imagine the perfect tour to the most famous sights of the south and the east, we’re bringing it to you! Join us and see the most beautiful parts of the country in this full-day excursion to the South Coast on a minibus. 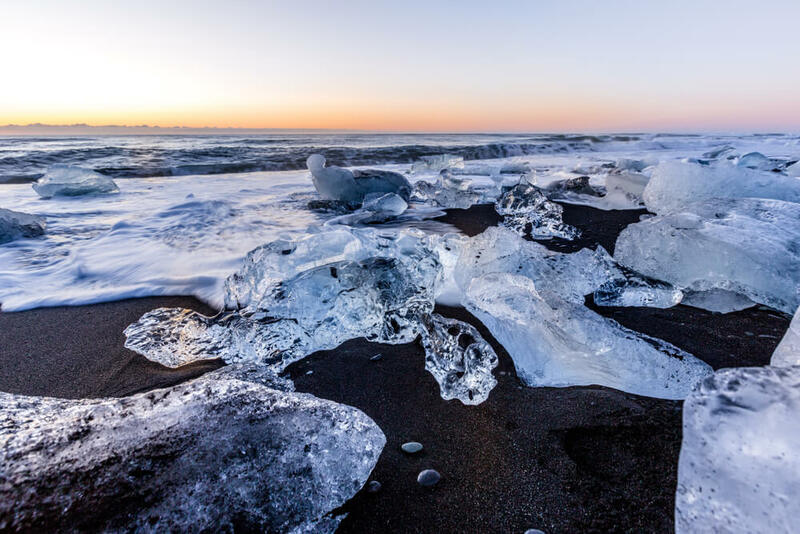 This comprehensive tour takes you to Jökulsárlón glacial lagoon and its counterpart across the road, the diamond beach as well as the waterfalls and black sand beaches. The adventure begins when we pick you up in Reykjavík in a small and comfortable minibus before heading straight to the South. Our arrival is announced by the powerful theatrics of Seljalandsfoss. Bring a raincoat and you’ll be able to make the short hike behind the falls. The scene behind the fall and the trembling ground from the power of the falling water makes for an automatic Instagram blockbuster! 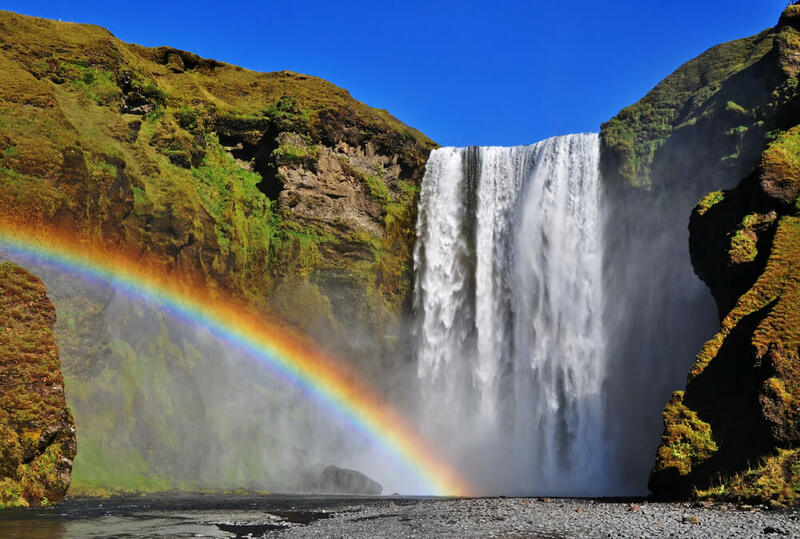 Further east along the coast is Skógafoss waterfall. Skógafoss is an incredibly picturesque sight. Tucked in a little gorge, the river Skógá tumbles down a 60-meter cliff before continuing down the landscape towards the Atlantic Ocean. Alongside the gorge, a staircase can take you to the shelf above the waterfall for stunning views. See if you can count your steps on your way up. Continuing east, we head to Vík í Myrdal, the southernmost village on the Icelandic mainland. 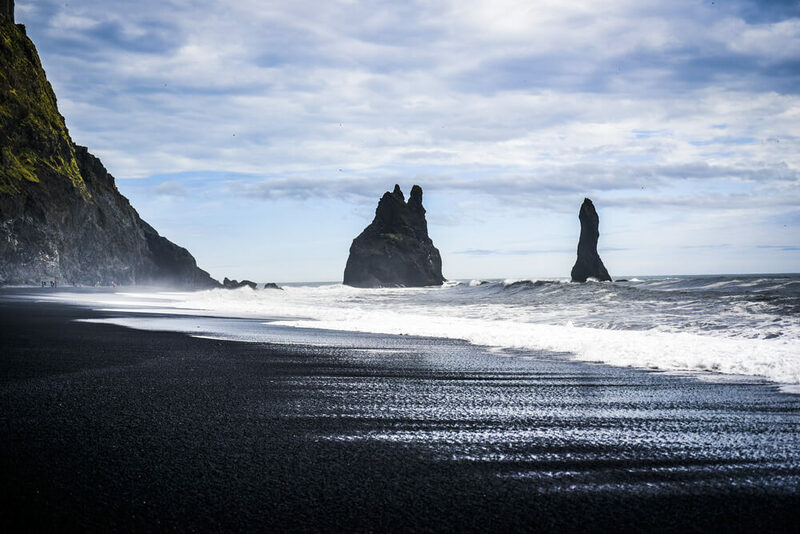 With only 300 residents, Vík is a wonderful place to stop and is a popular sightseeing route along the South Coast for its convenience and beautiful surrounding landscapes. Looming over the beach are enormous basalt stacks that, along with the crashing waves of the North Atlantic and the panoramic views to the east and west make this area the most beautiful and unique beaches in the country from where you can see Reynisfjara, the black sand beach. The journey proceeds as we approach the stunning Jökulsárlón glacier lagoon. Formed by the receding Breiðamerkurjökull glacier, it is now 200 meters deep and stretches from the edge of the glacier’s current location and all the way to the Atlantic coastline. 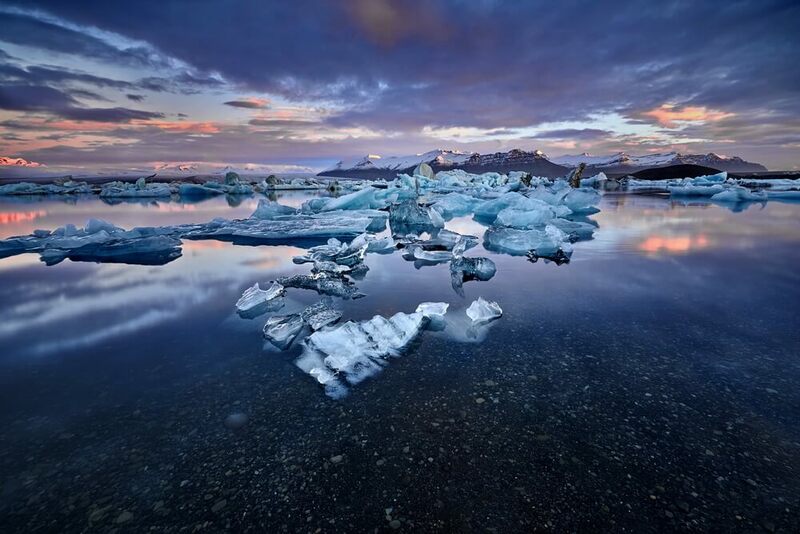 The lagoon itself is filled with icebergs that have fallen off the glacier’s edge and float around in the lagoon until they are small enough to pass through the shallow river from the lagoon to the ocean. While the magnificent colored ice is the main attraction on site, the occasional seal popping its head up out of the water or resting on the icebergs makes the glacier lagoon totally unique. Just across the road from Jökulsárlón glacier lagoon lies a beach containing clear ice rocks spread all over. The ice is the remains of the icebergs once floating in the lagoon itself, having run through the river to the ocean and been tossed onto the beach by the roaring Atlantic waves. This can only be compared to a magnificent piece of art. In the summertime, we can even observe it from a closer angle and get a nice view of the icebergs with the sun reflecting on the ice. During wintertime, this is when the Northern lights hunt begins. Between stops, while exploring all the best of the South and East, we invite you to relax in our comfortable minibus. Our nice, knowledgeable and experienced guides will keep you entertained and informed along the way. We offer free Wi-Fi on board and an appropriate playlist of Icelandic music for the drive. A dinner stop is made on our way back to Reykjavík at the end of the day.